페니케, 포르투갈의 Decklodge | 호스텔월드에서 예약하세요. We were born with the dream to create an atmosphere that gathers people together from all over the world with the wish to live magical moments, learn about other cultures and starting conversations with strangers that feel like family.We offer to travellers a unique space that feels like home. 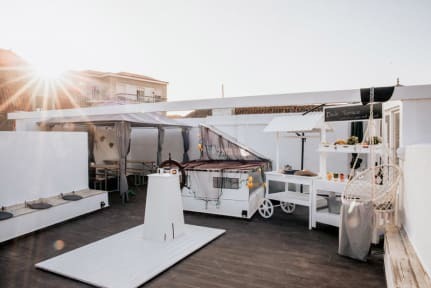 where to stay even in shared or private rooms designed creatively, co-living spaces that are good for socialising and sharing moments, an agenda that includes personal life experiences that enhances the senses of body and mind. We also provide spaces to relax and chill while you are with us. This property is minutes walk from the beach. Situated within an 8-minute walk of Peniche Fortress. All units at the guest house are fitted with a seating area. The rooms include a private bathroom with free toiletries, while some feature sea views.